There is a terrible man of my acquaintance called Bob the Food Snob. A few years back, I told you about the friendly food rivalry Bob and I enjoyed. The bad news is, it continues. Our competition still revolves around a teenage drive to be hipper-than-thou. We maintain a schoolyard race to be first at discovering anything delicious. Like a pair of enemy truffle pigs, our snouts are always down trying to unearth a treasure. We get extra points for finding truly exotic cuisine. First there was the annoying Armenian Incident, followed by the intense southern African mêlée and the too-close-to-call Afghan dispute. Damn you, Bob, I found that pilaf first. Now, the battle lines have been drawn over Burma. The race is on to find the best Burmese food in Melbourne, and although I have three more places yet to visit, I’m feeling fairly smug about striking a vein of the good stuff at my first outing. I approached River Kwai Thai & Burmese restaurant expecting to find a cheap Asian suburban eatery; a busy hive packed with students from neighbouring Monash. Not so. From the plush carpeting, warm red walls and quality fittings to the friendly and gracious welcome, River Kwai makes a great, non-studenty first impression. 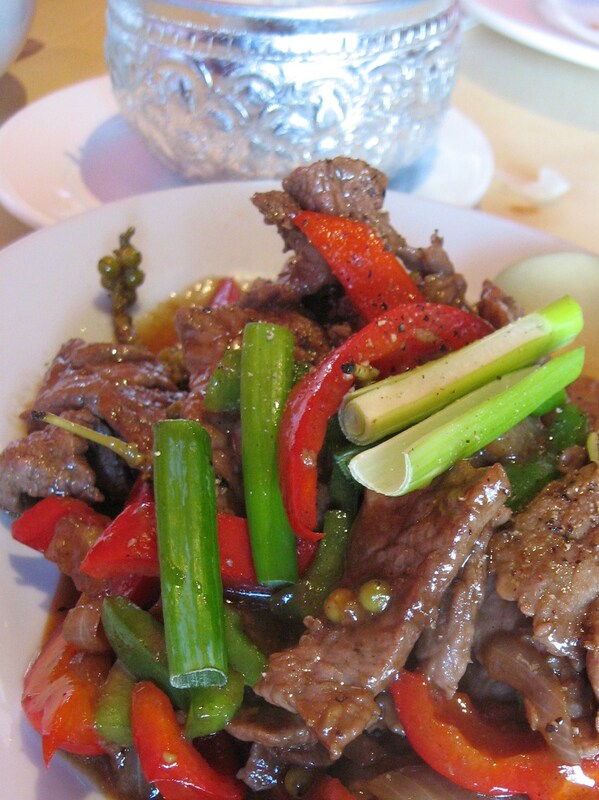 Here, Thai dishes dominate the entrees and soups. Partner and I opted to start with one of the items from the vegetarian section of the menu, River Kwai Tofu. 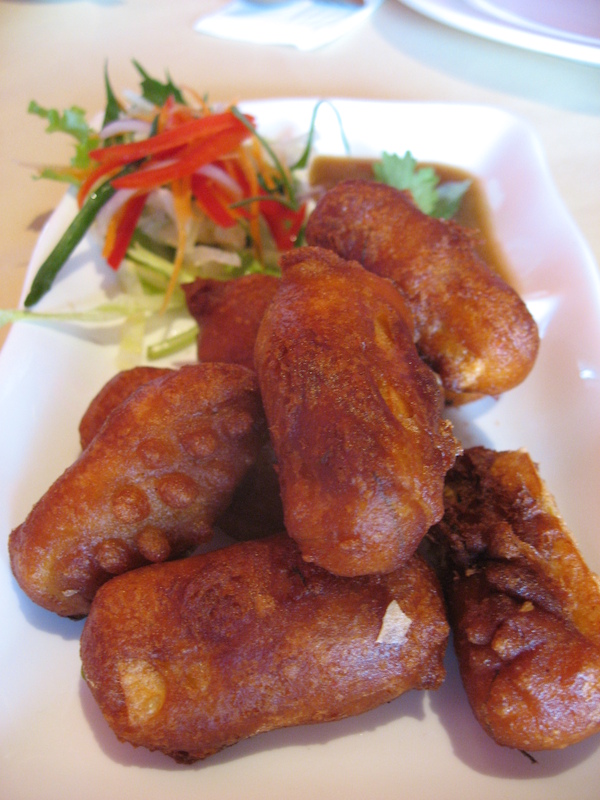 Deep fried and served with tamarind sauce, it points to Burma’s proximity to China. The sour punch of the tamarind relocates the compass to South-east Asia. It’s this sort of spinning, I will later tell Bob, that we can expect from Burmese cuisine. Thanks to history and geography, the food of the nation has been heavily influenced by Chinese, Indian and Thai technique. Nonetheless, the menu delineates clearly between Thai and Burmese curries. 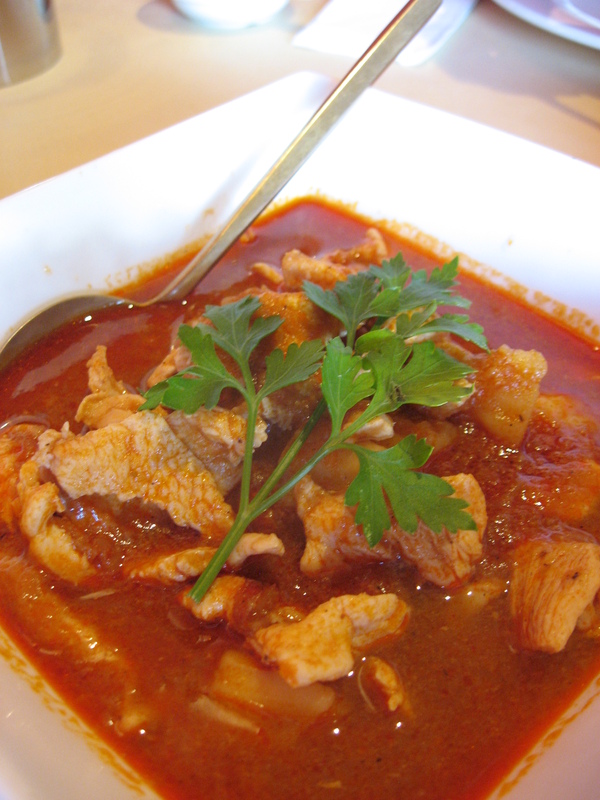 We order the Burmese Kyak Thar Arloo Hin, a chicken curry. With a tip of the hat to India, ground coriander and cumin make their way into the mix. The overall flavour is more akin to Malaysian curries and the comparison is buoyed by the inclusion of potato. It has a sweet, slightly sour and persistent full flavour without too much heat. We’re not in Thailand anymore. I resist a sending a smug SMS to Bob and get stuck into the next dish. Nir Gratiem takes us back in the direction of the Thai border. But, we travel by way of China. This stir fry is extraordinary. The beef has the silkiness often found in good Chinese cooking; probably the result of some chemical treatment and definitely a secret no cook will divulge to me no matter how I beg. The meat is dressed with garlic and pickled peppercorns and carries a clinging gravy based on oyster sauce, fish sauce and palm sugar. Actually, it tastes like a South East Asian peace treaty. So, I ordered extra and dropped it off to Bob. I think he’s annoyed that I found it first; he’s declared a cease fire in order to regroup.